The history of the Palazzo Caracciolo Napoli - MGallery by Sofitel has its roots in the Neapolitan aristocracy. The hotel draws its name from the Caracciolo di Santo Buono, who were a powerful family that played a central role in the history of southern Italy, especially the Kingdoms of Naples and Sicily. The Caracciolo family acquired the land that the hotel now occupies when they were given a castle just outside of the old city of Naples for loyal service to the king. This castle was later damaged by a dramatic earthquake and replaced with the Palazzo Caracciolo, the current structure, in 1584. Since then, the building has survived revolution and invasion, held the court of the Doge of Naples, and hosted the weddings of European royals. 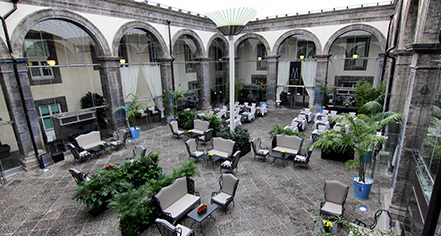 Now, this historic building is home to the beautiful Palazzo Caracciolo Napoli - MGallery by Sofitel. The Palazzo Caracciolo Napoli features 146 guestrooms where history blends with the modern requirements of hospitality. The rooms are naturally sound-proofed by the substantial old walls and are fresh during the summer, while being comfortable in winter, with a generous range of amenities. The hotel also has three wonderful dining establishments: La Cucina, Nel Chiostro, and the Bar and Wine Cellar, where guests can enjoy a gastronomic journey of discovery through the flavors of the great Neapolitan tradition. For guests who want to relax after a long day of exploring the history of the city, attending business meetings, or traveling around the world, there is the hotel spa, which features a solarium with sunbeds and a Jacuzzi, as well as a wellness center with massages, a steam room, and sauna. For business travelers, the hotel also boasts eight modular business rooms that are highly adaptable and perfect for a wide range of meetings and events. Surrounding the Palazzo Caracciolo Napoli is the wonderful and historic city of Naples. Declared a UNESCO World Heritage Site in 1995 because of its 2,500 years of history, this city has a wealth of culture and history just waiting to be discovered. From the buried ancient structures of the Macellum to the lively and chaotic Spaccanapoli street that runs through much of the town, cultural travelers will find an endless bounty of experiences lying just outside the hotel door. The hotel is also convenient for business travelers, being located in one of the major cities in southern Italy and just a short drive from the Naples International Airport. 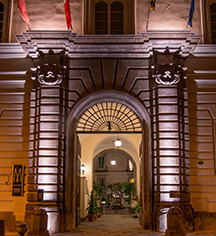 Palazzo Caracciolo Napoli - MGallery by Sofitel, a member of Historic Hotels Worldwide since 2018, dates back to 1584. The Palazzo Caracciolo Napoli was briefly used as the capitol of the Neapolitan Republic by Henry II de Lorraine, before the fledgling state was crushed by John of Austria in 1648. Cribs and Pack-in-Plays: Available upon request; €25 per night. Deposit: Credit card always required for guarantee. Hotel/Resort Fees & Taxes: A tax is imposed by the city of €3.50 per person, per night, up to 14 nights. This tax does not apply to children under 18 years of age. Pet Policy: €15 per pet, per night. The history of the Palazzo Caracciolo Napoli - MGallery by Sofitel has its roots in the Neapolitan aristocracy. The hotel draws its name from the Caracciolo di Santo Buono, who were a powerful family that played a central role in the history of southern Italy, especially the Kingdoms of Naples and Sicily. Learn more about the History of Palazzo Caracciolo Napoli - MGallery by Sofitel .